This is it: the last chance to get the leftover rewards created for the #BringBackMST3K Kickstarter. These items were all created exclusively as Kickstarter rewards, and will never be manufactured again. Once they’re gone, they’re gone… so be sure to grab yours now! All items ship directly from our warehouse within a few days of your order! These COLLECTIBLE MST3K STICKERS are perfect for enhancing binders, phones, laptops and public property. Featuring stickers for each of our main characters, plus some other familiar images from MST3K, you’ll want enough for your whole family and/or movie theater! 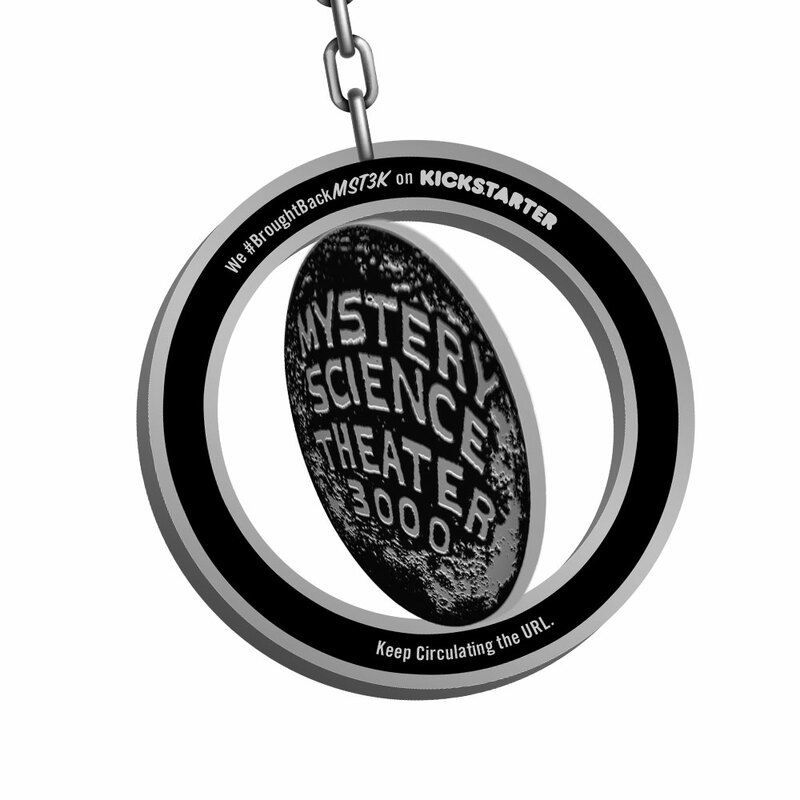 Lock it down with THE OFFICIAL MST3K KICKSTARTER KEYCHAIN. Featuring a spinning medallion of the MST3K MOON and cast in the sturdiest of metals, it'll be sure to impress your friends when hanging from the dashboard of that Megaweapon you're driving… and this is your last chance to get one! Bust out some thread and start stitching these OFFICIAL MST3K MISSION PATCHES onto your backpack or Rowsdower-approved denim jacket. Featuring JOEL (100 missions), MIKE (97 missions) and JONAH (0 missions), they're the perfect way to prove you'll sit through anything. Plus, the set also includes a GIZMONIC patch and an MST3K MOON patch! 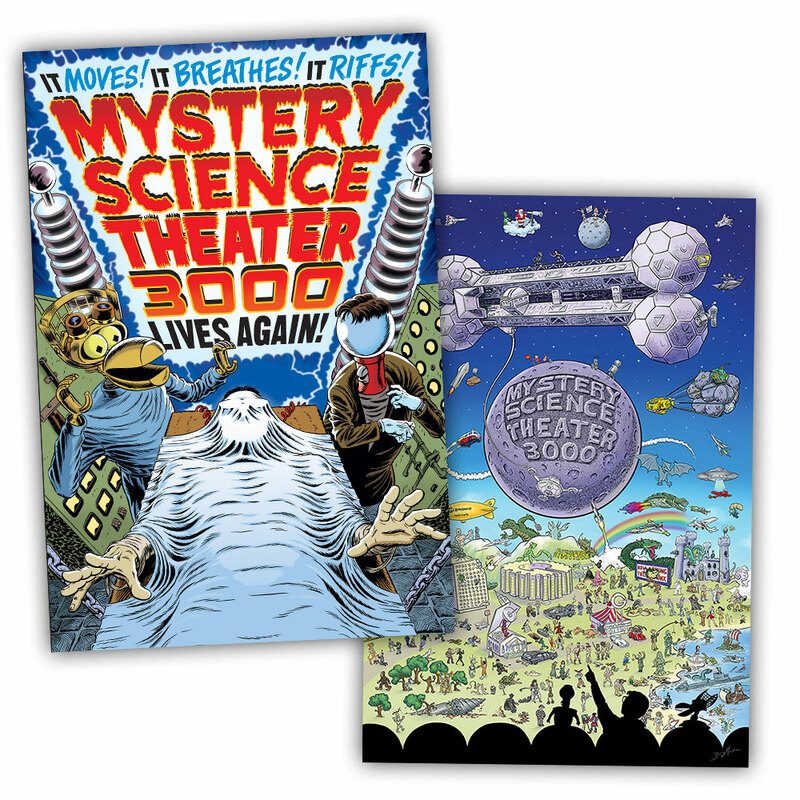 Get a set of MST3K COLLECTIBLE POSTCARDS, featuring artwork from a dozen of the best movie posters designed by Steve Vance for MST3K's DVD box sets, in beautiful 4" by 6" dimensions. Suitable for framing, mailing and writing the greatest poem in the world! Includes designs for Warrior of the Lost World, Kitten With A Whip, Danger!! Death Ray, Final Justice, Master Ninja I, Pumaman, Radar Secret Service, The Final Sacrifice, Daddy-O, Laserblast, Santa Claus, and Manos: The Hands of Fate! Want to see the first new episode of MYSTERY SCIENCE THEATER 3000 the way the universe intended? Now you can, with the MST3K: REPTILICUS - VHS EDITION! Lovingly converted back to archaic and generally inferior video quality, with a special introduction from Joel just for this edition, this is the perfect gift for relatives who still prefer to watch everything on VCR. This OFFICIAL MST3K TIKI MUG was created just for backers of the #BringBackMST3K Kickstarter and will never be offered again! We have just a few dozen of these mugs left. Made of custom-molded and hand-painted ceramic, it's the perfect drinkware for any moon-themed tiki bar. We might be 9 months into THE ART OF THE NEW MST3K: AN 18-MONTH CALENDAR, but that means you still have 9 MORE to go – and we’ve cut the price to make up for lost time! Plus, you’ll still be getting 18 big, beautiful pieces of original concept art, – suitable for hanging or framing! – created by Guy Davis to help #BringBackMST3K! Created just for our Kickstarter and never available again, the CROW T. MIMOBOT® is perfect for when you want to transport some files and don’t care who knows it! Loaded with some special digital MST3K goodies to customize your desktop, the CROW T. MIMOBOT offers 8 GB of space – enough to take a few of your favorite episodes of MST3K anywhere you go, plus a spreadsheet of who lives and who dies! Created just for our Kickstarter and never available again, the TOM SERVO MIMOBOT® is a true find for the discerning USB drive collector. Loaded with some special digital MST3K goodies to customize your desktop, the TOM SERVO MIMOBOT offers 8 GB of space – enough to take a few of your favorite episodes of MST3K anywhere you go! The OFFICIAL MST3K KICKSTARTER POSTER is perfect for sprucing up those barren walls, with original designs on BOTH SIDES: one by long-time MST3K poster artist Steve Vance, and the other by the incredible Barry Munden, featuring a mural with references to every single episode of MST3K! You'll probably want two, just so you don't have to choose – and this is your last chance to get them! The MST3K KICKSTARTER COLLECTOR'S BOXED SET (DVD) is perfect for people who love downloading video, but still need something to display on the shelf. Or who can't get high-speed internet. 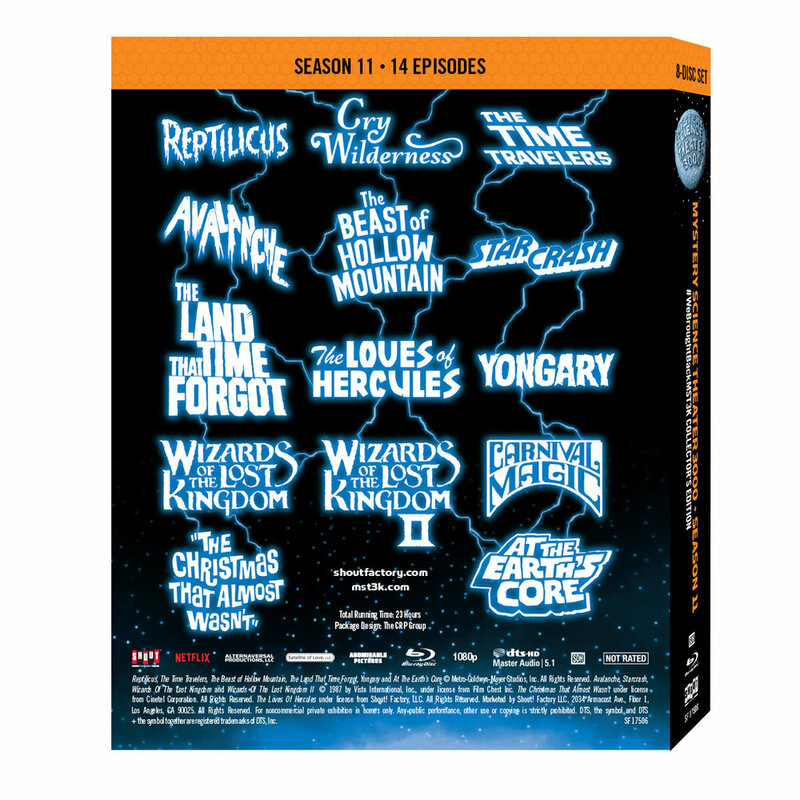 Anyway, this boxed set includes all 14 new episodes that were funded on Kickstarter, and an EXCLUSIVE BONUS DISC of content that is only available in this collector’s edition set! And also, it has Closed Captions. The MST3K KICKSTARTER COLLECTOR'S BOXED SET (BLU-RAY) is perfect for people who love downloading video, but still need something to display on the shelf. Or who can't get high-speed internet.